Cute couple George (left) and Mildred (right) are both over 10 years old. 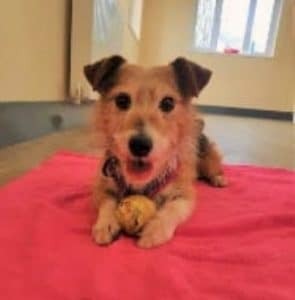 George is a Terrier cross. 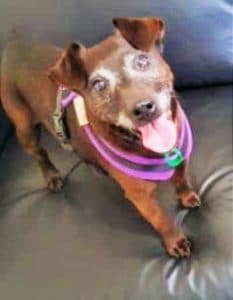 Mildred is a brown Patterdale Terrier. They want to be the only dogs in the home and could possibly live with children from age 12. They’re in the care of Jerry Green Dog Rescue in Boston, Lincolnshire. They are a sweet little pair, very clean in their kennel and are happy being left on their own for up to 4 hours. They really enjoy company and love to both have lots of cuddles and yet, they share people very nicely! George and Mildred are super friendly and always happy to see new people, especially if that means treats and cuddles! They both love their food. George can get a little grabby with his, so he isn’t suited to be around small children. They could possibly live with a cat pending a cat test, so ask the rescue if necessary. Just don’t get your hopes up. Being Terriers, they might feel compelled to play chase with any cats they meet. George has a bit of arthritis so only needs short walks and Mildred enjoys these too. Both are very gentle on their leads. George has ongoing medication for his arthritis. Mildred recently had some mammary lumps removed and is recovering well. They are both spayed/neutered and have lovely fresh breath from having had recent dentals. 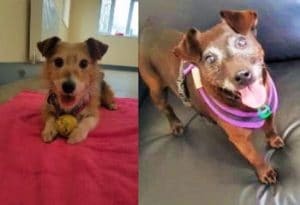 Can you offer this adorable pair the love/lap they crave? Please say you saw George and Mildred on the Oldies Club website.